Customized finishing solutions. Turnkey installations, all from one source! 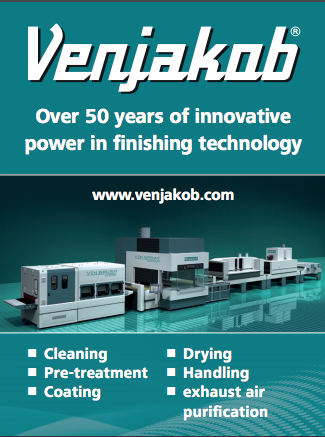 Venjakob is an international operating manufacturer of fully automated surface technology. Experience over decades supplemented about qualified and motivated employees made the company become an internationally operating and acknowledged technology leader. Venjakob provides various system solutions for applying liquid materials on different kind of workpieces in different geometries. Benefit from Venjakob cross-industrial knowledge! Intensive product developments generate a broad portfolio of standard and customized system solutions for fully automatic surface finishing. Venjakob, always a suitable finishing solution. Simply let our team know your requirements and we will develop a solution, together with you.